Ada Mary Babine (b. September 2, 1927) died at Serenity House, Santa Barbara, on November 28, 2018, after a brief illness. She was the fourth of five children of Albert Matlack and Anna Walker. Born in Wilmington Delaware, she moved with her family to Ramona in rural San Diego County at a very young age. and spent her early years on the family’s turkey farm there. She attended Whittier College and then received training as a medical lab technician, and worked in that capacity until 1948, when she married Walter Joseph Babine, a WWII veteran. They had five children together, and moved to Santa Barbara in 1958. Ada returned to school and graduated in 1963 from UCSB with a degree in Elementary Education. She spent the next 40 years teaching K thru 4 and training teachers for the Goleta Union School District and the Santa Barbara Joint Unified School District. She worked in her later years as a substitute teacher and did not retire fully until well into her 80s. Her commitment to the highest ideals of teaching inspired generations of Santa Barbarans. 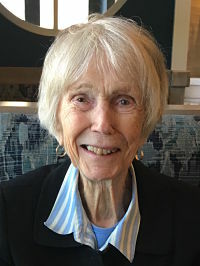 An avid backpacker, she led her family on many trips into the Santa Barbara backcountry, the Sierras, and Big Sur, and these trips with family and friends continued until she was in her 70s. Her love for nature and commitment to the environment found expression in the Sierra Club, which she joined in 1958. She served as chairman of the Santa Barbara Group, was on the executive committee of the Los Padres Chapter, and was the Sierra Club’s representative to the Naples Coalition. She was also active in the Audubon Society and the Santa Barbara Natural History Museum, where she served for a time as president of the Museum League. Ada gave generously of her time to the local community. She was a charter member of the Pearl Chase Society, treasurer of the Mesa Neighborhood Association, and on the board of the Architectural Foundation. She was a member of the Citizen’s Planning Association and the Unitarian Society. A skilled watercolorist and oil painter, she worked as an organizer of Art Walk for ten years. Ada’s love for her family and friends was legendary. She was an enthusiastic hostess, and created wonderful Sunday and holiday meals, which were always memorable and intellectually engaging events. She cast a wide net in her community over her six decades of residence, and will be missed by a large and diverse community of friends. Ada was predeceased by her siblings and by her daughter Catherine. She is survived by her children David, Anna, Walter Joseph, Jr., and Sarah, and by her loving granddaughters Alana Bailey and Lily Hays. A memorial service will be held at the Unitarian Society of Santa Barbara (1535 Santa Barbara Street) on Saturday, January 26, 2019, at 1 p.m.